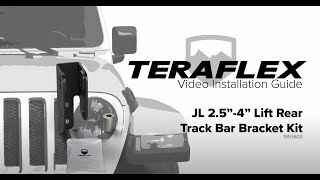 The TeraFlex JL/JLU: Rear Track Bar Axle Bracket Kit corrects vehicle roll center, restores factory handling, and reduces body roll in lifted JL/JLU Wrangler models. Multiple mounting locations allows neutral lateral alignment of the rear axle on JL/JLU models with 2.5-4.5” lifts. Bolt-on bracket mounts to the rear axle.